What’s this? The third or even fourth cat this year? Yes indeed, this is what it’s like at the cutting edge of the world wide web. We’re used to owners embellishing their cats agility but Doris makes a refreshing change. Apparently she can’t be arsed. Fair play to her, jumping over things is overrated. Unless, of course your judging a cat on agility then such abilities are very much rated. Doris is polydactyl, we were very excited when we found this out, mainly because we thought it said pterodactyl, we did wonder why a prehistoric flying lizard had been submitted to a cat review site. Once we realised our mistake we were again very excited. Doris has got thumbs. This means she is the next stage of feline evolution and could, at a push, open her own tins of cat food. Apparently she does wheeze a bit but we’re ignoring this because she has thumbs. Although she doesn’t have a great history of breaking into other houses she has lived in a fair few places. She once lived with Len but he got rid of her because she tripped him up. It doesn’t seem very tolerant but also fairly short sighted by Doris. She’s lived in Tidbury Green and Whitlocks End which sound like completely made up places. She also lived in Sid and Linda’s conservatory. We have absolutely no idea who any of these people are but it’s good solid background. With a fair vocabulary she can wax lyrical on a variety of topics. It’s nice to meet a cat with a decent range. Too often cats are entirely food focussed. Doris lets people know when her water bowl is empty. This is very good because decent water intake is good for her kidneys. We don’t really know enough to cover this. We assume that other cats recognise who evolutionary superiority and respond accordingly. We know she doesn’t back down from cats trespassing in her garden but that’s what they’re supposed to do. Leaving aside the evil green eyes we think Doris is quite cute. She’s getting on a bit (is she? We’re not sure how old she is) so has the look of a well lived cat. She’s got a nice face. We’ve been told that her quiet snores are endearing but with the fact she is prone to wheezing this might be dodgy lungs. Dodgy lungs aren’t cute. We were going to ask Len to mark this section but given the way she tripped him up we thought he might be a bit biased. She seems to have made a number of human friends over the years so we’ll give her quite a good score. She once went to Scotland, on holiday, and pranced round a motorway service station in a harness. Funny? Yes. Dignified? No. She has been penalised for the harness rather than going to Scotland. If cats want to go to Scotland than that’s fine with us. Her submission implies she can read. We doubt this. In all the years of doing this we haven’t come across a single cat that could read. She fell for the whole harness thing so we think she isn’t too clever. Having said that she apparently used to busk. This indicates a grasp of commerce. She’s done well for herself. A number of different homes but still seems to be a settled individual. As far as we can work out she hasn’t really had any substantial brushes with death but she should get those lungs looked at. Doris took a hammering in a few categories there, particularly dignity, agility and fighting. This proves the genius of this system, an active cat with a disdain for the world (and prone to violence) is purity of the feline species. If Doris is going to lead cat kind to the next stage of life on earth then she needs to up her game and jump about a bit more (and possibly punch something). Alas Doris was pts tonight. Her dodgy kidneys finally getting the better of her. Poor D.
Poor old Doris. Sorry to hear that. 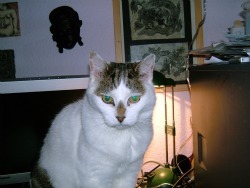 She was a great cat.